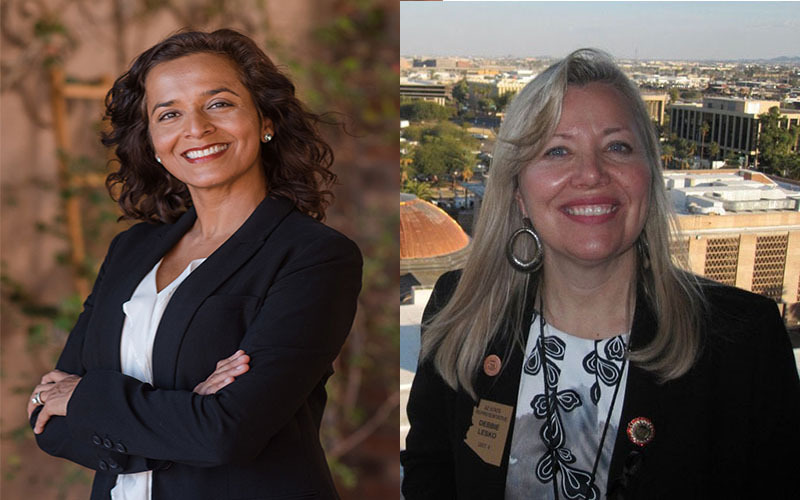 WASHINGTON – It’s been a good week for first-time Democratic candidate Hiral Tipirneni, with campaign finance reports and recent polls showing Arizona’s heavily Republican 8th District more competitive than it has been in years. But with less than a week to the election, most experts still see Tipirneni as a long shot to beat former Republican state Sen. Debbie Lesko in the district where former Rep. Trent Franks, R-Glendale, never won less than 63 percent of the vote. And Lesko is not taking it easy. She was in Washington Wednesday for a GOP fundraiser headlined by House Speaker Paul Ryan, and she maintains a commanding lead in money from outside groups supporting her bid. But analysts say that Democrats, in the district and around the country, have been motivated this special election season, leading to a close race in a normally safe district. “Every vote is important in this race,” said George Khalaf, president of Data Orbital, a political consulting firm in Arizona. The 8th District has been a Republican stronghold since the current boundaries were drawn in the 2012 redistricting. President Donald Trump won the district with a 21 percent margin in 2016. The seat came open when Franks, who was in the middle of his eighth term, resigned in December in the face of a House ethics probe of sexual harassment charges by female staffers. Those included allegations that Franks inappropriately asked women on the staff to act as surrogates for him and his wife’s efforts to have more children. The open seat has drawn interest – and money – from both parties in a district where total spending by candidates in the last election was just over $377,000, more than $360,000 of which was by Franks. Tipirneni, a former emergency room doctor, had raised $740,549 as of April 4, the most recent report to the Federal Election Commission, compared to $564,404.34 reported by Lesko for the same period. But outside Republican groups have poured $702,685 into the race to support Lesko, and another $460,982 in opposition to Tipirneni, according to opensecrets.org. But while the outside money for Lesko can be seen as a sign of concern by the GOP, Tipirneni faces a different problem. She has received just $14,114 in support from outside groups – none from the Democratic Congressional Campaign Committee – which could indicate a Democratic lack of confidence. “If the DCCC felt that this race is worthwhile, they would’ve been pouring in an equitable amount of money,” Khalaf said. He called the spending disparity “the biggest indicator” that Lesko is leading. Recent polls have split on just how competitive the district is. A poll released last week by OH Predictive Insights showed Lesko with a 10 percentage point lead, safely beyond its 4.38 percent margin of error. But a poll Monday from Emerson College gave Tipirneni a 1 percentage point edge in a poll with a 5.2 percent margin of error. Spencer Kimball, the director of the Emerson poll, said the two polls may actually be closer than they appear if the margins of error for each are factored in. But Khalaf said the two polls “are like apples and oranges” because of the way they were weighted. OHPI used a formula to predict the parties of those who would turn out to vote, which led it to make 50 percent of its poll respondents Republican, 28 percent Democrats and 22 percent independents. Emerson based its poll on party registration in the district. As a result, only 40 percent of those polled were Republicans, while 25 percent were Democrats and 35 percent were independents. Khalaf said that if 35 percent of the vote ended up being independents, “it would be a statistical anomaly to the millionth degree.” And party affiliation in early voting, according to data from the Maricopa Recorder’s Office, is closer to OHPI’s prediction. As of Tuesday, 140,974 early votes had been cast in a district with 455,660 registered voters: 48.5 percent of the early ballots were from Republicans, 27.8 percent were from Democrats and 23.2 percent came from independents. But Kimball said that “early returns can be misleading in what those turnouts are, the safe number is the voter registration.” He said he is confident in his model, pointing to other races Emerson has polled where early voter numbers that heavily favored one party did not hold up through Election Day. “You’re looking at a pretty close race,” Kimball said. Kondik said the two polls taken together indicate to him that Lesko is in the lead, adding that there is nothing “that suggests the early voting is very favorable to Democrats.” But even keeping the race close can be seen as a victory for Tipirneni and Democrats, he said. “If the Democrat holds it to within a single digit loss, it would be a pretty impressive performance,” Kondik said.